Boils, also referred to as abscesses, occur when bacteria invade a break in the skin, a blocked oil gland or hair follicle. White blood cells rush to the site to battle the bacteria, causing blood and pus to collect as an abscess deep within the skin. Although boils are unsightly and cause discomfort, you can treat them safely at home with old folk remedies. Bacteria cannot survive when an adequate blood supply exists, says Canadian homeopathic physician Dr. Peter Bennett in the book "Alternative Cures." Bennett suggests using hot compresses on boils to diminish bacteria associated with the skin disorder. Dr. Rodney Basler concurs. As quoted in the book "The Doctors Book of Home Remedies," Basler states, "Applying a warm compress is the very best thing you can do for a boil. The heat will cause the boil to form a head, drain, and heal a lot faster." When a boil first erupts, soak a clean washcloth in boiling water, wring it out and apply it to the boil for 20 minutes. Repeat twice daily for two days, and then use alternating hot and cold compresses to draw out the pus. Immerse a washcloth in boiling water, wring it out and apply it to your boil for 10 minutes. Do the same thing with a washcloth dipped in ice water. Repeat the cycle three times, twice a day. Vegetables play an important part as old folk remedies for boils. Any number of vegetables work as variations of the hot compress method for drawing out pus-filled abscesses. 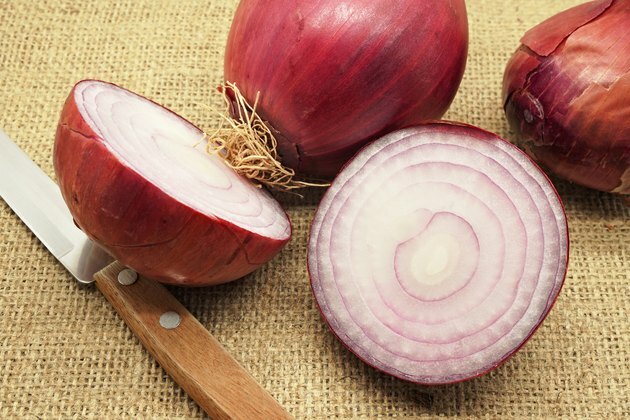 Try heating a slice of tomato, raw onion, a mashed garlic clove or an outer cabbage leaf wrapped in a handkerchief in a microwave for 15 to 30 seconds. Apply it to your boil at bedtime. Dr. Varro E. Tyler, professor of pharmacology at Purdue University, recommends a poultice from the pantry. Bread and milk compresses can draw out the pus and pain associated with boils, according to the Mother Nature website. Mix 1 tbsp. of milk and half a slice of bread into a paste. Apply it to the boil with an adhesive bandage. After two days the boil usually bursts. Bacon fat and adhesive bandages have battled boils for generations. Also a well-known folk remedy for splinters, "bacon fat may act as an irritant to increase the flow of moisture to a boil, bringing it to a head," according to the book "Home Remedies What Works." Simply put a piece of bacon on an adhesive bandage, and apply it to your boil at bedtime. Change the bacon piece every 12 hours until the boil bursts and the blood and pus drain. Apply an antibiotic ointment to the wound for two to three days.